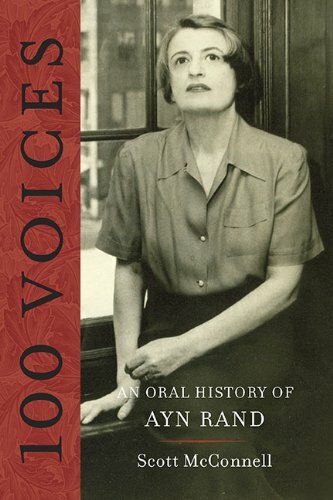 100 Voices: An Oral History of Ayn Rand by Scott McConnell. Book suggested for rating by Betsy Speicher. Guess who posted the first review on Amazon -- after reading around the clock to finish the book? As interest in America’s greatest philosopher skyrockets and sales of her magnum opus “Atlas Shrugged” jump from 100,000 to 200,000 to 500,000 copies per year, it’s wonderful to see this wealth of new material. The book’s 638 pages are crammed with insights into Ayn Rand’s life, character and personality, from a wide range of people and perspectives, covering every period of her life. The 100 interviews are arranged chronologically, starting with her long-lost sister Nora, who is perhaps the only one in the book to outspokenly dislike Ayn Rand. The sisters were close as children, but were separated upon Ayn’s escape to America in 1926. By the time they were eventually reunited in 1974, Nora had been psychologically broken; Ayn Rand offered her a chance to stay in the United States, but she chose to return to the Soviet dictatorship. No wonder the two sisters failed to get along. These interviews should thoroughly discredit the smears in Barbara Branden’s malicious pseudo-biography, which she did not publish until Miss Rand was dead and could not sue for libel. Miss Rand’s long-time cook and housekeeper Eloise Huggins, too, expresses shock at Branden’s slurs against Frank O’Connor. (p. 441) Secretary Cynthia Peikoff describes a dishonest trick Barbara Branden tried to pull, in an attempt to gain legitimacy for her book (pp. 553-555). She had unexpected admirers in writer Mickey Spillane (p. 232), rock guitarist Duane Eddy (p. 364), and actress Racquel Welch (p. 566). Miss Rand sat at a table, smiling benevolently at the fans who packed the room and towered over her, cheerfully signing dozens and dozens of autographs on programs, books, pamphlets, anything that came to hand. She didn’t look like a world famous writer. She was as natural and unpretentious as could be, and seemed innocently, almost childishly happy to be meeting people who loved her books. After a while the manager came and told Miss Rand it was time to close the building. “Oh, couldn’t we stay just a little while longer?” she smiled up at him, and he relented. Ayn Rand is a hot topic. Unfortunately, a couple of recent books about her exhibit slipshod scholarship and little depth of knowledge of her ground-breaking ideas. Still, there are good books about her: “Ayn Rand: A Sense of Life,” by Michael Paxton, reproducing the text and many pictures from his Academy Award nominated film, and Jeff Britting’s “Ayn Rand.” “100 Voices” now joins them, as an invaluable resource that expands our knowledge of the great writer’s life. It will be treasured and enjoyed. This sounds intriguing. Thanks for the tip, I think I'll be getting this book. Is this a quote from Ayn Rand herself? Thanks for that excellent review, Bill. I'll be ordering my copy soon. I've read about the first 150 pages. It is absolutely fascinating! Cf. The Virtue of Selfishness : "Pleasure, for man, is not a luxury, but a profound psychological need." When creatively mixed to a Rand new sum. Ah! Her goodly name snuck in! Ayn Rand is at the top! That's a good one, Brian. I wonder what the best way to buy this book is, for someone living in Sweden? Thank you, L-C. As for your question, perhaps someone else can answer it. That is useful, ewv, thanks. Looks like the low dollar makes US stores the cheapest options. This should be good. You can also download a Kindle edition. You do not need to own a Kindle device; just download the (free) Kindle for PC application. "For those who are curious about Ayn Rand’s relationships with her colleagues in the wardrobe department at RKO, her editors, her lawyers, her doctors, and (my least favorite sections) her fans, this is a must-read book." Bold added. Wonder why this is the case? To the best of my knowledge, I you are a Swede, like me you will have to order this book (which I have not received yet, although I have ordered it) from The Ayn Rand Bookstore. This book *might* also be available from the Swedish Internet book seller www.adlibris.se . I have not had time to check for this new book there yet. But Adlibris does carry many titles by Ayn Rand (and, unfortunately, also some of the pseudo-Objectivist books by people such as the Brandens and Libertarian commentators on Objectivism). Thanks for the link, Betsy. I've just sent for a couple of Miss Reuben's detective books from an outlying library. Let us know what you think of them. In verse would be interesting, but also in straight prose for clarity and precision! If the tales are well-spun, I'll tell; if they are not, I'll tell as well. "All who were lucky enough to have dealings with Ayn Rand had the chance of a lifetime to observe her intelligence in action at lectures and other venues. She was always judging the content of what was said around her and to her. But if you couldn't withstand the heat of that, you didn't belong there." Scott McConnell's book is filled with little gems just like the one above and for those that might value from something like this, I can now recommend it without hesitation. Published in 1988, "Julian Solo" is Shelley Reuben's first book. A detective story? Throw that classification out the window! I have read only 103 of its 216 pages and have been amply rewarded with a veritable blockbuster of a story. Yes, there is a very unique mystery here, but it does not involve hidden clues, like a drop of blood or hard-to-break false alibis. The mystery is in the characters, but the characters do not in the main consist of people with a multitude of dirty secrets. For the most part, the characters are healthy, radiantly alive, rational, purposeful men and women. The author describes them beautifully, bringing each one to vivid and individual life. And the setting---New York---oh, how Miss Reuben loves New York! She loves writing about it and you, the reader, can feel and experience that love yourself. Here one finds glittering jewels of descriptive passages---which don't annoy, but move right along with the story. They are also a celebration in themselves. The writing is brilliant, just as the unique structure of the story is brilliant. "Julian Solo" might be called "light reading", but so far (after only a hundred pages) it is a serious and joyous light reading. Now I have finished the story. The next hundred pages were gut-wrenching and the outcome was satisfying. A very well told tale, of which Miss Reuben should be proud. I should add, how wonderful life can be when men fight fiercely for their values. The reason I'm just about to order this book is that I think anecdotes can be very useful, not to supplant formal biographies or her own books, but to supplement them. They enable you to watch this magnificent person's actions and reactions during real events. In a way, I think it helps concretize Objectivism through Ayn Rand herself, much like the advice Leonard Peikoff offers in his podcasts.